At 3,950 feet wide and 176 feet tall, the legendary Niagara Falls is the most powerful waterfall in North America. 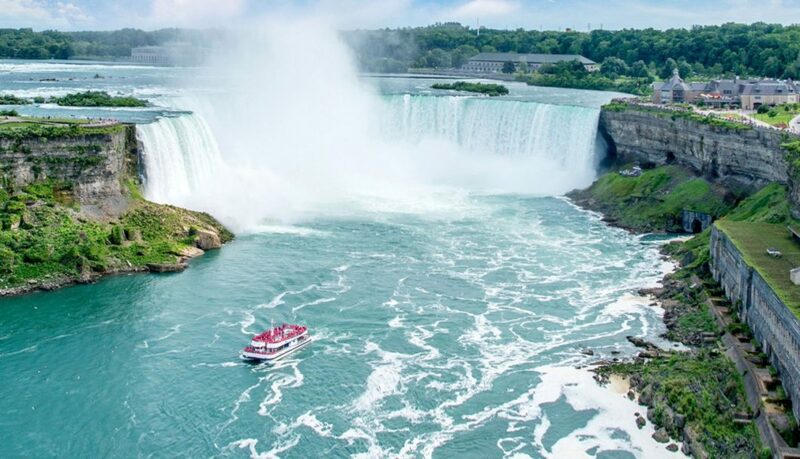 Straddling the border between the U.S. and Canada, Niagara sees approximately 3,160 tons of water go over its edge it every second. It’s said The Great Lakes contain 20% of the world’s freshwater. Most of it passes over Niagara Falls as it drains into the Atlantic Ocean via the St. Lawrence River. Many of us can remember a trip to Niagara Falls and recall hearing the water’s power as it roared from below. Now, think if all that water tried to go over the falls through a single fire hose. If you had a miracle hose that wouldn’t bust, the pressure would create a water jet that goes for miles. Yes, it’s a ridiculous scenario. But it’s a useful analogy for explaining how the gold mining sector would be affected if some of the world’s largest investment funds decided to make even a small increase in their allocation to physical gold and gold stocks. It would be like trying to drain Niagara Falls with a fire hose. Just a small percentage increase in allocation towards gold and gold stocks among global fund managers would make gold stocks double… and then double again… and double again. When it comes to the investment markets, a small investor has no effect on asset prices. Even the buying and selling of a wealthy individual with $200 million has no effect on stock and bond markets. The guy with $200 million is a mouse when it comes to the elephants. By elephants, I mean large pension funds, large hedge funds, large insurance funds, and large sovereign wealth funds. These funds invest the money for tens of thousands of people. They control not just hundreds of millions… but often hundreds of billions. For example, oil-rich Norway’s $1 trillion sovereign wealth fund controls 5,000 times more money than the rich guy with $200 million. Elephants like Norway’s fund managers are the people that move markets and create long-term price trends. Now realize that the managers of these mega funds are just regular people. They are as likely to fall victim to groupthink as anyone. They don’t like to stray far from the herd. They tend to make the same decisions at the same time. When a group of large investment funds decides to buy into a market, they can put well over $100 billion to work. So, elephants typically stick to very large, very liquid markets like large-cap U.S. stocks and corporate bonds. However, some elephants occasionally stray from the herd. They buy into less liquid markets. For example, some of them will buy gold stocks and physical gold. If concerns over the safety of the global monetary system increase (as they did in 2008), more than a few elephants will want to buy gold and gold stocks for both protection and profit potential. That elephant money will flow into a relatively tiny sector. The current market value of all major publicly-traded gold companies is around $330 billion. This might sound large, but it’s actually tiny in global finance terms. 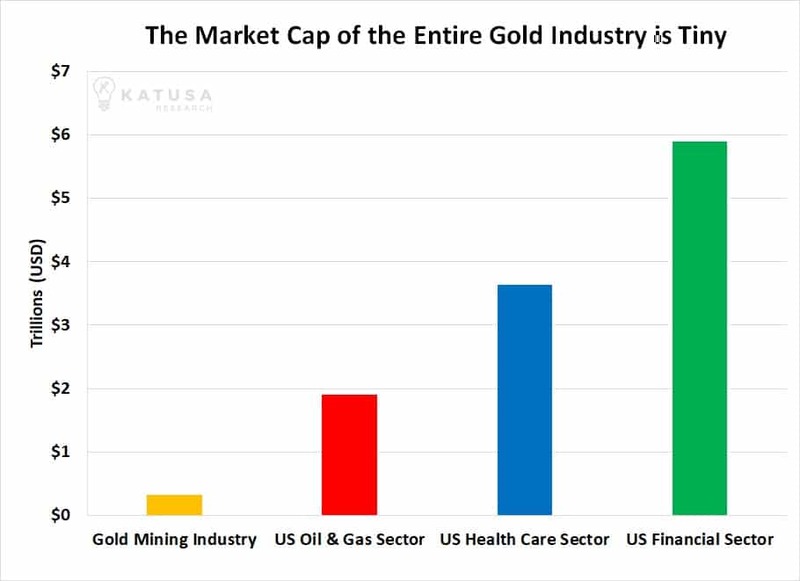 The entire gold mining industry is smaller than just Facebook ($500 billion market cap) or Google ($650 billion market cap). The chart below shows this comparison, along with Apple and U.S. oil and gas industry for good measure. To look at it from another angle, consider the $20 billion market cap of the world’s largest gold mining company, Newmont. Newmont is a giant that shapes the industry. It does some of the biggest deals. It has the resources to hire the industry’s best people. It produced over 5 million ounces of gold in 2016. That’s a tremendous amount of gold. Yet, a $20 billion market cap won’t even get you a spot on the top 20 North American oil and gas companies. Newmont is smaller than 266 companies in the benchmark S&P 500. If just 10 out of the hundreds of money managers around the world with more than $50 billion to invest were to each place just 1% of their portfolios into Newmont, they would buy 25% of Newmont. That very small ripple in the ocean of large fund management would produce a buying tsunami that lands on the shores of the gold mining industry. If you’re thinking that, you’re dead wrong. This line of thinking isn’t theoretical. Two situations in recent history show how small sectors can stage extraordinary moves when even a small percentage of the world’s capital flows into it. ***In 2003, I spent a lot of time and energy researching the uranium market. I became convinced the industry would face a supply/demand crunch which would send uranium into a major bull market I took a huge position in uranium stocks. At the time, the uranium market was much smaller than the gold market is today. The world’s largest miner, Cameco, had a market cap of just $2 billion. My thinking turned out to be right. Uranium entered a bull market and attracted a lot of investor interest. But because the industry was so small, investment capital could only flow into a handful of legitimate uranium miners. During the uranium bull market of 2003 – 2007, Cameco climbed 1,300%. Pitchstone Energy climbed 700%. Paladin Uranium climbed over 1,000%. ***More recently, the cryptocurrency market has shown us how extraordinary price moves can happen when money flows into a small sector. In 2016, the cryptocurrency market began drawing a large amount of investor interest. But at the time, the market cap of all cryptocurrencies amounted to $7 billion (less than 1.5% of Facebook). As money flowed into this small market, cryptocurrencies like Bitcoin soared more than 10-fold. Some soared more than 100-fold. There’s an old saying “A rising tide lifts all boats.” Well, when the tide flows into a small market sector, the boats can rise 10, 50, even 100 times higher. They go from sitting quietly in the harbor to riding tsunamis of investor money. Right now, it’s estimated that 1.4% of the world’s financial assets are allocated to gold and gold stocks. This laughably small percentage shows the world doesn’t care much about gold right now. But just a modest increase in this allocation percentage would hugely influence gold stock prices (some money would go into physical gold and gold ETFs, but a lot would flow into gold stocks as well). 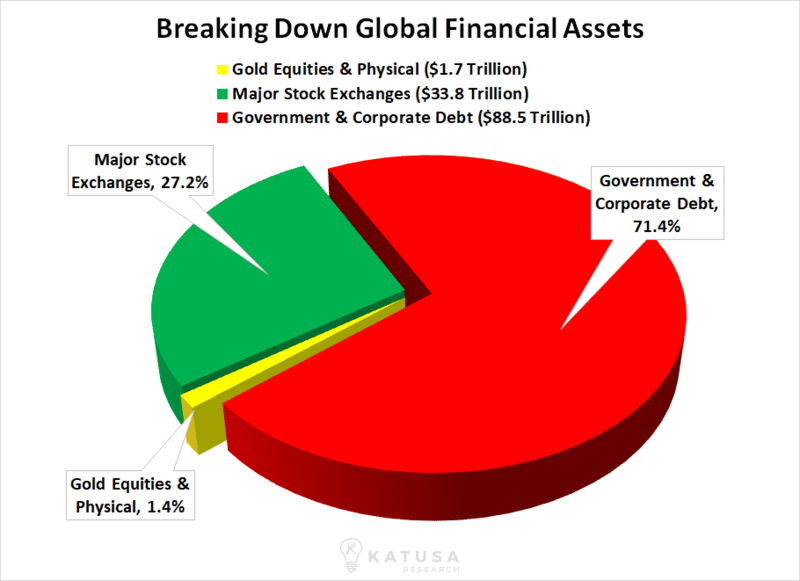 To be clear, I’m not saying the world’s biggest money managers will wake up one day, decide to allocate 10% of their portfolios to gold and gold stocks and make gold and gold stocks double in a single trading session. I am saying that if gold enters a bull market, it’s going to be front page news. It’s going to come up at investment committee meetings. Big money managers will feel pressure to allocate to gold. People will begin to see buying gold and gold stocks as a prudent way to ensure portfolios against a global monetary accident. Moving substantial amounts of money into gold and gold stocks would be a gradual, multi-year process. If you’re a younger investor, you might think this scenario sounds crazy, but it’s been a standard money management practice before. I believe a gold price breakout above $1,400 per ounce is coming soon. This would represent a multi-year high in the gold price. It would be a nice round number the media can quote and hype. It would ignite more and more interest in gold. But investor money will flow into a tiny area. My advice is to get into gold stocks before the elephants arrive.